Thanks again for everyone's feedback on the Quiz; it's been both informative and interesting to read! v2.0 of the FORT SQ incorporates just a few changes. More may be on the way, but they'll likely be internal. I'd like to settle on the questions pretty soon. Instructions: Each of the following questions offers you a choice of two answers. To the best of your ability, choose exactly one of the two choices. For some of the questions, you may want to answer "It depends," or "One leads to the other," or "It's a mixture of the two." Try to resist this as much as possible. Feel free to elaborate on your answers, as I think we'll all find that interesting; however, the Quiz is scored essentially mechanically. I'll respond when I can with your Sorting. What has had greater influence on who you are today, your genes or your life circumstances? What is more important to the success of a team--clear and decisive leadership, or everyone being dedicated to the cause? Suppose you made a wonderful discovery. Which part would you enjoy more--making the discovery, or sharing it with the world? What is the gravest problem facing us today--what we are doing to each other, or what we are doing to the Earth? What do you believe has greater impact, great ideas or great acts? What is more important in settling disputes--righting a wrong, or avoiding future disputes? You and your friends have to defeat a dragon (just say!). If you had your choice, would you help construct the plan of attack, or put it into action? (Optional) Which house do you see yourself belonging to? How have you been Sorted in the past (e.g., on Pottermore, by earlier versions of this Quiz, by CoS, or any other on-line Quiz)? This question has no impact on your Sorting. Fans of the FORT SQ will recall that its name stands for Factored Opposition Round Table Sorting Quiz, first of all because that's how the scoring system is derived (questions about oppositions arranged around a sort of compass rose), but also because I like acronyms. Ten points to those who realize why I particularly like this name. This Quiz is composed of seven questions, because seven is kind of a special number in the HP mythology, and because Pottermore's Sorting Hat also uses seven questions, and I wanted to see if I could capture what I think of the houses in the same space. The questions in this Quiz are designed specifically to avoid the stereotypical qualities of the houses (for instance, that Slytherins are sneaky, Gryffindors are brave, Ravenclaws are smart, and Hufflepuffs are...well, they're none of the above, I suppose is the idea). For one thing, I think those stereotypes are inaccurate, and for another, I don't think anyone would answer such questions reasonably. My guess is that Rowling's Quiz operates on the same premise. I hasten to emphasize, nonetheless, that this Quiz represents only what I personally think of the houses, and may very well not accord with what either you or Rowling think of them. Comments to the effect that I must be crazy and/or stupid because my Quiz sorted you as Ravenclaw and you are anything but will be cheerfully placed in the circular file, piped to /dev/null, floated into Outer Tumbolia. (Ignored.) Constructive comments, on the other hand, will be carefully considered. Disclaimers: All rights reserved. For entertainment purposes only. Author is not to be held responsible for any damage to self-image that may result from consumption of this product. Do not take product while driving or operating heavy machinery. This product--like hamburgers, pain relievers, comic books, and indeed practically anything worthwhile in the known universe--contains chemicals known to the State of California to cause cancer and birth defects or other reproductive harm. Contents are sold by weight, not volume, and may have settled during shipping and handling. Professional driver, closed course. This product has not been evaluated by the Food and Drug Administration, and is not intended to diagnose, treat, cure, or prevent any disease. Do not taunt Happy Fun Ball. Attempts to reverse-engineer the FORT Sorting Quiz scoring table will likely be found entertaining but will not lead to fame, fortune, or any combination thereof. OK, here's my first attempt at a Sorting Quiz. (I hope this is OK to try here.) This started from the Pottermore thread, and represents my thoughts about some (certainly not all) fundamental aspects of the various houses. Some of you who have read my posts in the Pottermore thread will already know my interpretations of a couple of these questions, but hopefully, the rest will be new to you. I'd like to playtest the Quiz, so as to see how consistent the answers are, internally. The quiz consists of seven questions, each with two answers. In many cases, you may find that both answers accord with you to some extent; if so, please make every effort to choose exactly one of them. Of the seven questions, one of them is a tie-breaker of sorts, but I'm not revealing which one it is. That would be telling. If you like, you can add which house you feel you belong to, either by self-identification or by quiz. Hey stop! Why are you taking this version of the Quiz--didn't you read the message up at the top?! What do you think has had greater impact on who you are today--your genes, or your upbringing? You have a free evening at home. Would you rather spend it in conversation with a few friends, or on your own with music and a nice hot cocoa? Which would you enjoy more--making a great discovery, or sharing that discovery with others? What do you think is the greatest problem facing the world today--what we are doing to each other, or what we are doing to the Earth? What do you think is more important in settling disputes--who did what to whom, or what will happen to the two sides? Are you ruled more by your heart, or by your head? The revised questions are in bold. Hey! Don't take this version, take v1! Would you rather be with a group of friends, even if that meant doing what the group wanted, or do what you love, even if that meant being on your own? Do you define yourself by what you do, or how you view the world? What do you think is more important in settling disputes--righting a wrong, or preventing future disputes? Before I score the quiz, please let me know if the revised wording would have led you to change your answers. Hey, v1 is now available! Go take that one! What do you think has had greater impact on who you are today--your genes, or your life experiences? Do you prefer company (even just one other person) or solitude? Suppose you made a great discovery. Which part would you enjoy more, making the discovery, or sharing it with the world? What do you believe has greater impact on the world--great ideas, or great acts? If you have to defeat a dragon (just say! ), would you prefer to act now, to gain the element of surprise, or to plan carefully, to prepare for the unexpected? I may change some of the questions back to the earlier form, but in the case of Q2, I've decided directness is the best policy. The revised questions are in bold. Other changes: Name is back to Quiz, not Hat. More significantly, the scoring table has changed. Most important for the Sorting: Did you know that v1 is now available? Go take that one! What do you think has had greater impact on who you are today--your genes, or your life circumstances? Do you prefer the company of friends, or solitude? What do you think is more important in settling disputes--righting a wrong, or avoiding future disputes? Instructions: Each of the following questions offers you a choice of two answers. To the best of your ability, choose exactly one of the two choices. For some of the questions, you may want to answer "It depends," or "It's a mixture of the two." Try to resist this as much as possible. Feel free to elaborate on your answers, as I think we'll all find that interesting; however, the Quiz is scored essentially mechanically. I'll respond when I can with your Sorting. Note to those who took v0.8 of this Quiz: There are only subtle wording differences, so that the Quiz reads less repetitively. There should be no substantive change to your Sorting. What do you think has had greater influence on who you are today--your genes, or your life circumstances? Suppose you made a wonderful discovery. Which part would you enjoy more, making the discovery, or sharing it with the world? What do you think is the gravest problem facing us today--what we are doing to each other, or what we are doing to the Earth? What do you believe has greater impact--great ideas, or great acts? (Optional) Which house do you see yourself belonging to? How have you been Sorted in the past (e.g., on Pottermore, by CoS, or any other on-line Quiz)? This question has no impact on your Sorting. OK, I think I'm just about done with this, for a good while, at least. Thanks to everyone who helped me shape this thing. I've renamed it the Factored Opposition Round Table Sorting Quiz, first of all because that's how the scoring system is derived (questions about oppositions arranged around a sort of compass rose), but also because I like acronyms, and I now get to call this the FORT Sorting Quiz. Ten points to the first person who realizes why I particularly like this name. Disclaimers: For entertainment purposes only. Author is not to be held responsible for any damage to self-image that may result from consumption of this product. Do not take product while driving or operating heavy machinery. Contents are sold by weight, not volume, and may settle during shipping and handling. Professional driver, closed course. Do not taunt Happy Fun Ball. Attempts to reverse-engineer the FORT Sorting Quiz scoring table will likely be found entertaining but will not lead to fame, fortune, or any combination thereof. I changed the answers to 5 and 6 after you rewrote them. I also think that 1 should include a third option -- once you're past a certain age, neither your genes nor your upbringing really impact "who you are today". Your life experiences do. Which is why I answered the way I did. I'm interested to see how you sort me. I'm guessing you self-identify as Slytherin, based on your sig. Well--and keep in mind that this is still under construction!--this Quiz sorts you as a hard Ravenclaw...in fact, about as hard a Ravenclaw as one can be under the current Quiz organization. You're secondarily a Slytherin, to be sure, with minor Hufflepuff bits, and absolutely no Gryffindor. So, a mixed bag in terms of how well it reflects your own self-perception, but a home run in terms of internal self-consistency. Probably a combination of both. The way my "innate" personality and self interacted with my upbringing shaped who I am. But if I were to choose one - my upbringing. It really depends on the situation and the people. Sometimes, I'm in a mood for socializing and would rather be with a group of friends, but then again, I need some alone time just focused on something I love. It's a balance. I guess being with really good friends or family would outweigh being alone, but if it were just random, casual friends, I choose alone time. If I have to choose one, I choose the alone time option. Probably sharing the discovery with others, because it would allow me to experience that feeling over and over again. What we are doing to each other. What we are doing to the Earth is a dire problem, too, but the Earth is stronger than us. It will rise up again and renew itself. But we can easily self-destruct. Definitely by how I view the world. My inner world is who I am -my actions often are haphazard or unfocused. Righting a wrong is my natural inclination. Hmm, I don't know. I'm in the middle. I really am. It depends on the situation. I know I should choose one. Internally by my heart, externally by my head? what you love, even if that meant being on your own? Do you define yourself by what you do. Doing something I loved. I'd rather be on my own than do something I really don't want to do. What we are doing to each other, because that sort of includes what we are doing to the Earth as well . What I do. How I view things changes a lot but my actions mostly remain constant. EDIT2: I originally went with righting a wrong but I would like to change my answer to this and go with preventing a dispute, if that's ok? Part of preventing disputes from re-occurring is to look at the cause and to address that accordingly. I think this is more of a win-win situation because it can lead to the wrong being righted even if that wasn't the original intention and at least there will be a procedure or something put in place to deal with any other grievances that arise so another dispute doesn't arise. My head. I will listen to my heart/gut/whatever but my head will always have the final say. EDIT: Overall, I don't think the rewrite caused me to change any of my answers but I probably would have considered the alternative for #2 a bit more. Last edited by Miss_Gaunt; September 1st, 2011 at 5:13 pm. 1. What do you think has had greater impact on who you are today--your genes, or your upbringing? 2. Would you rather be with a group of friends, even if that meant doing what the group wanted, or do what you love, even if that meant being on your own? 3. Which would you enjoy more--making a great discovery, or sharing that discovery with others? 4. What do you think is the greatest problem facing the world today--what we are doing to each other, or what we are doing to the Earth? What we're doing to each other. 5. Do you define yourself by what you do, or how you view the world? 6. What do you think is more important in settling disputes--righting a wrong, or preventing future disputes? 7. Are you ruled more by your heart, or by your head? After the re-write, I changed my answers on 5 and 6. Last edited by MerryLore; September 1st, 2011 at 1:50 pm. I agree with Sadira Snape that by my age experiences have a lot to do with who I am, but if you're forcing me to choose I'll vote for nature over nurture although it's a close-run thing. Do what I love - I have no problems with being on my own. I don't think there's much to choose! I'll go with what we are doing to each other. I'm more concerned with people than the planet but I'm quite concerned with some of the effects we are having on ecology. Probably what I do. It's certainly how I define others. Preventing future disputes I think, although it would depend on the severity of the wrong. I think my head in the long run. Certainly as I've got older. I get put in different houses in different quizzes so I'm quite interested to see how you sort me. I've never been put in Slytherin though and I think that's right as there's little ambition in me. Last edited by horcrux4; September 1st, 2011 at 2:02 pm. Actually, I was sorted here as Slytherin. Interesting. Every quiz I've taken sorts me as Slytherin, with strong leanings towards Ravenclaw... I guess in reality I'm a Slytherclaw. I always score INTJ on the Meyer-Briggs tests. Yeah, I think once you're past a certain age, or have accrued a certain level of life experience, you change yourself based on that and your upbringing (i.e. the influence of your parents' ideologies) counts less and less into your concept of self. 1. Genes. All the upbringing in the world cannot change your true nature. 2. I'd rather do what I love doing, even if it's alone sometimes. 3. Sharing it , because I want to get credit for it, unless it is something I could keep up my sleeve, so to speak, and use to my own advantage. 4. What we do to each other. 5. How I view the world, which appears to go hand in hand with how I react to things. 6. You have to get to the reason for the dispute, and then if anybody has been wronged, you need to find a way to fix it, and definitely work on ways to prevent it from happening again. 7. My head, at first I was going to say "heart", but the heart can be wrong sometimes. I can't say the wording really affected anything, as I didn't read the other version that thoroughly. I agree with Horcrux4 and Sadira, that your age can determine a lot especially on question one. A lot of these questions can be answered with a little of both options, you know, as in one answer can actually tie in with the other. Last edited by GrimeldaDursley; September 1st, 2011 at 4:15 pm. I would choose Do what I wanted, even if it meant doing it on my own. when it comes down to it, I would love to say head, but being honest with myself, it would be my heart. That was actually pretty tough. Great questions! Also, please ignore my signature and sort me where you think I should go. I'd rather be by myself because I don't necessarily need people to be around me. I don't trust very many, trusting many people and then getting stabbed in the back will only put more stress on me, and I'm already too bogged down by what I'm trying to achieve for my future to deal with those immature problems. Even if I'm not doing what I like to do, I'd rather do it alone. I don't think I would be making a lot of discoveries. I'd be off doing my own thing, because I need to live my life. If I happen to make a discovery well then hurray. But if I have to choose I would probably share it so I could get credit because if I did all the work I would want people to know that I did and ME alone.And getting to tell people over and over could be tedious, but I'll get the feeling of accomplishment because I did it and no one else. Both are big problems, but what we are doing to each other is inevitable, and only so many people will join the cause to help save the earth considering it takes away luxuries that many enjoy. I don't think either one trumps the other, because both are very arguable subjects that I try not to dwell in them because there are bigger problems that need my attention. A little of both. What I do is determined by how I view the world. Righting a wrong. It's hard not to have future disputes because there will always be a little twinge that you still think you are right or the other person is wrong etc. By righting it you can deal with the problem at hand, and life can go on and people can get back to what they were doing. I am definitely ruled by my head. I don't open my heart up to much so I don't show weakness with emotions, I use my head a lot more because things are logical, not lovey and gooey which is by far harder to understand. Hearts aren't always the best thing to listen to, they will disrupt your path to what you are trying to achieve because you will be viewing your end through emotional glasses changing your view on how it should be achieved. If I looked at my college plans through my heart, things might change, but when I look at it logically everything is in order and I know what I want and how I'm going to get it. Proudly Sorted COS: SLYTHERIN!, Pottermore decided: SLYTHERIN! 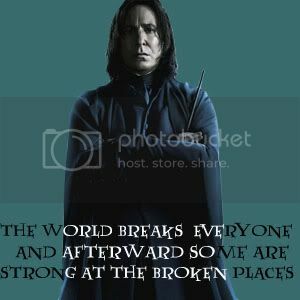 Last edited by Always_Snape; September 1st, 2011 at 6:56 pm. Thanks for all your responses. I must say, it's a bit intimidating going through this exercise, because I think the results may be a bit against your intuition. And that's OK--the Quiz is still being revised. And I'll have a few words to say about how the Quiz is constructed, which is a partial rehash of what I've said in the Pottermore thread, but with some new information. EDIT: Always_Snape now Sorts as Slytherin with some Ravenclaw, after answering Q3. OK, once you have your jaws back up , here's the basis on which this quiz is sorted. Think of the houses as being placed on a compass rose, with Slytherin, Ravenclaw, Hufflepuff, and Gryffindor occuping north, east, south, and west, respectively. (The exact order doesn't matter, but Slytherin does oppose Hufflepuff, and Ravenclaw opposes Gryffindor.) That doesn't mean that a person can't be part Hufflepuff and part Slytherin--only that the individual qualities that the questions test for have answers that oppose each other in the same way. So, for instance, the first question (as some of you probably guessed) is essentially a nature versus nurture question. The nature answer scores Slytherin with some Gryffindor, whereas the nurture answer scores Hufflepuff with some Ravenclaw. The rest of the answers also score the same kind of way, with some answers being more one house than another, and others being equal mixes of two houses. The scoring mixes are distributed in such a way that if the qualities are evenly spread out amongst a group of people, then the people should be evenly Sorted into houses as well. Thus far, that has not happened. Partly, I think it's because the beta-testers of this Quiz are not evenly distributed, but I think the question wording is also partly to blame. I'm looking at you, Question 2. From reading your detailed answers (thanks very much for those of you who took the time to explain your answers), I get the impression that the "group of friends" option is being deprecated, a bit at least, partly because of the implication that one will have to do something one doesn't like. That was not my intention; my intention is that you might not get the opportunity to do something you absolutely love (if your favoritest thing in the world is to do crossword puzzles, it's rare that you'll get together with friends just to do that), but you'll still do something you enjoy--just perhaps not as much. However, I didn't want to make the wording too long; I like to keep the question short and sweet. So I'll be thinking about how to reword that, and I welcome any suggestions or other observations. Not just about Question 2, but any of them. EDIT: The reason I'm looking at you, Question 2, is that no one--not one person--has Sorted into Gryffindor yet. Augree was one of the closest so far, but that's about as close as it's been. Last edited by BrianTung; September 2nd, 2011 at 6:21 pm. Trust me, this is not what my parents had in mind when they embarked on the whole "upbringing" trip - as they never fail to point out to me. When you put it that way... I have no preference. I happen to take great care in choosing people I call "friends". Otherwise there's nothing "great" about it, is there now? If you can't relate to those capable of offering feedback, you don't stand a Bowtruckle's chance in Hell of relating to those unable to. Same question, different wording... how I view the world, of course. Unlike some saintly figures, I don't always do what I think. Past is done and over with, and "wrong" is a subjective concept in a dispute. Future is yet to bear fruit, and thus is the one more worth investing into. "Heart" is by definition incapable of ruling. Ooh excellent. I'm not very surprised to see some Hufflepuff. I don't think I've ever been sorted there by any of the quizzes I've taken but I've always thought Hufflepuff would be my second house. I'm too much of a nerd to be in there properly though so I'm delighted Ravenclaw is on top. About question 2: It did occur to me that's what you meant by that question after I wrote my answer for it but, even though my reasoning would have changed slightly, I think my answer would have stayed the same. Both - with my own experience of life as the third factor. On my own. But anybody can join. To make a discovery means to share.Have you ever heard of an unknown discovery ? What will happen. The future is most important than the past. Aaargh! I haven't seen the modifications! # Would you rather be with a group of friends, even if that meant doing what the group wanted, or do what you love, even if that meant being on your own? Do what I love. But everybody can join. # Do you define yourself by what you do, or how you view the world? By what I do, because it has consequences. # What do you think is more important in settling disputes--righting a wrong, or preventing future disputes? Last edited by UselessCharmMaster; September 1st, 2011 at 9:43 pm.